Archival materials are often ancient and fragile. They are usually unique and therefore irreplaceable. Every researcher is responsible for assisting in the preservation of these documents to ensure that they are available for future users. 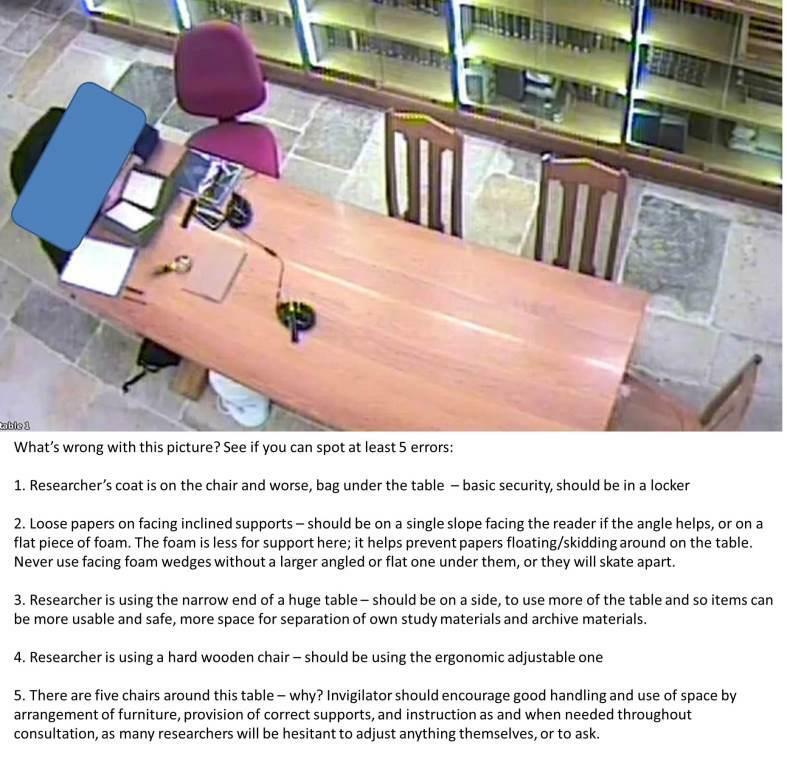 In addition to the usual library courtesies of keeping silence, not smoking, not bringing food or drink (including chewing gum or sweets) into the reading room and leaving all bags in the lockers by the west door, there are further guidelines for users of manuscripts or archival material. A member of staff will provide instruction on a first visit. Pencil only may be used. No ink, pens, correcting fluid or erasers may be used. Laptops are welcome; laptop bags should be left in the lockers. Water may not be brought into the reading room. Archive material cannot be borrowed and may not be removed from the reading room. For preservation and copyright reasons, please consult staff in advance of your visit about the use of scanners, digital cameras or other means of image capture. See our Reprographics Policy. Be aware that they are on CCTV throughout the building, and that their use of manuscripts will be invigilated by a member of staff. Wash and dry their hands before starting work and at any point during their research if their hands become dirty. Use gloves as instructed by staff. It is recommended that gloves be worn for consulting photographic formats as the natural oils and salts from even clean hands can have a detrimental effect. Use foam book rests, spine supports and lead snakes as demonstrated by staff. Turn pages gently from the outside edge. Use only the covered lead snakes provided to hold pages open. Avoid resting anything on a manuscript; please ask for assistance with keeping documents open or flat. Immediately call the attention of staff to any missing or damaged items. Keep the contents of a file in order and fastened together as produced. Leave photographs and documents in their protective archival polyester enclosures. Avoid touching the text block (i.e. any writing) at all, even with gloves. Slips of archival polyester can be provided to use as a reading line guide if needed. Ask staff for assistance when moving, opening or closing large or fragile volumes. Be careful not to mark, tear or otherwise damage manuscripts. Please ask for assistance.